Ad-Sol Nissin's ubiquitous network business supports creating networks that monitor and control energy, making the best use of the short-distance communication technologies of ZigBee® and PLC. Contact: Sales Department, Embedded Solution Business Division, Ad-Sol Nissin Corp.
NIST（US National Institute of Standards and Technology）specifies Smart Energy Profile studied by ZigBee Alliance for standard of communication for household energy control. 1) One-stop solution: Covers everything, from development/evaluation, trial production, and commercialization (mass production). 5) Offers communication performance evaluation tools for verifying communication conditions at installation site. Leave it to Ad-Sol Nissin to develop a ZigBee® system, from selecting the modules best suited to your requirements to proposing/developing the entire system! Ad-Sol Nissin has started offering uLook-SE (smart energy profile, SEP1.1) supporting series in addition to the standard series. This system realizes visualization of energy and the environment quickly, at low cost, and with a high degree of flexibility by collecting sensor information regarding the current, power, temperature, and humidity through wireless or power line communications. uLOOK does not require cumbersome network settings and new wiring construction. An optimum network can be created simply only installing a terminal and turning the power on. Communication range can be extended by installing an additional repeater terminal if direct communication cannot be established due to obstructions or distance. Communication range can be extended by installing an additional power line communication terminal and using the existing power line at a location where wireless communication is difficult, such as in or out of a shielded room. ・Energy can be managed from a remote location via the Internet. ・uLOOK can be connected to "Web sensing", environment information collecting ASP service. You can manage the environment information at each site in batches for a reasonable monthly charge without having to install or operate a server. ・In addition, customization of the connection to your system can be supported. The ZigBee® tap power sensor has been approved by Smart Energy Profile 1.1 as the first product of the uLook-SE series. As a domestic specification, the PSE mark has also been obtained, so that the sensor can be used immediately. For details of the equipment specifications, contact Ad-Sol Nissin now. 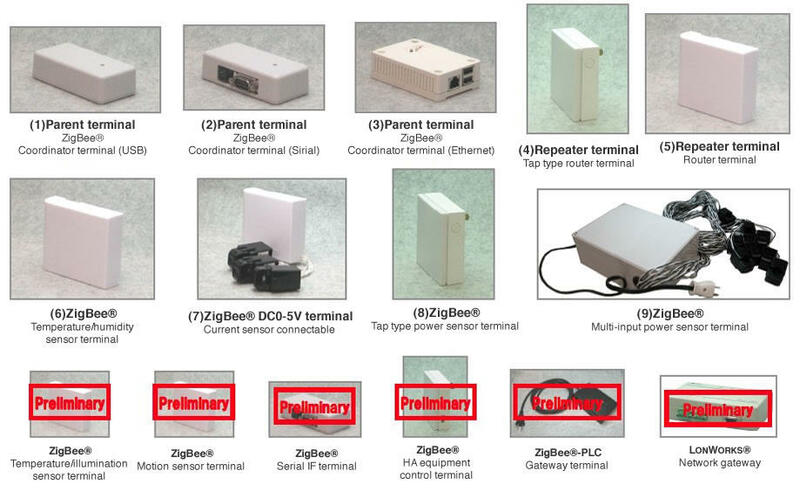 Communication status between two points of ZigBee® is scored in four levels of Excellent, Good, Fair, and Poor. In addition, channels can be set by using a rotary switch. ZigBee® communication environment evaluation system is a support tool to evaluate the wireless communication environment and communication performance at the actual site in the design stage of a ZigBee® system or other product. Some photographs shown on this site have been digitally enhanced.